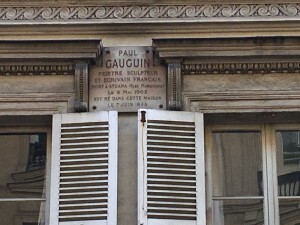 I woke up this morning to the sound of rain on the window. Most people, after wasting precious minutes complaining, would immediately think about finding a museum to spend the day in, but there is something about the simple pleasure of walking in the rain with an umbrella that has always transported me to a special place and I could not wait for the chance to do that in Paris. 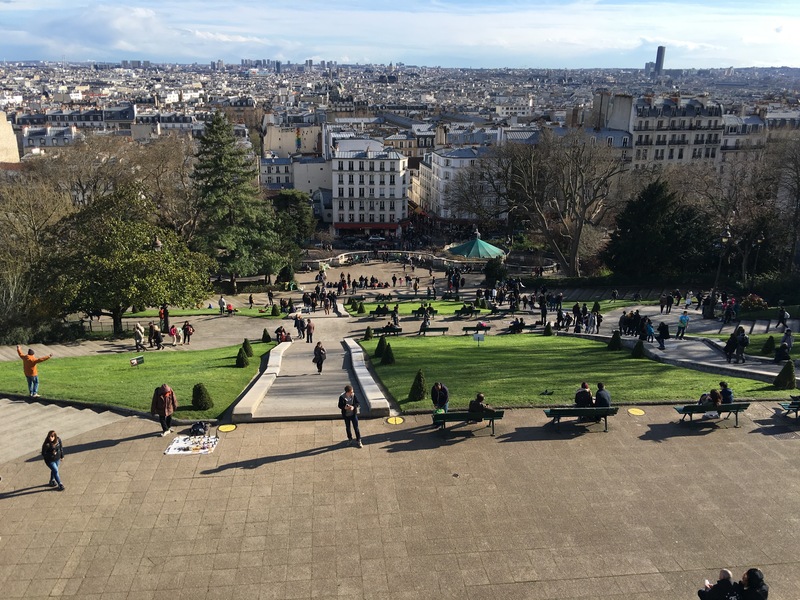 I had already made one foray into Montmartre, but I knew I needed to go back. 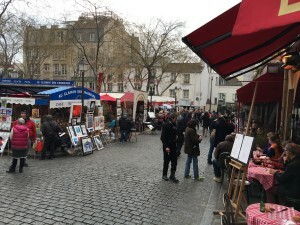 I had made the obligatory walk around Place du Tertre and fought off the onslaught of artists with pads in hand who wanted to sketch my portrait and I had admired the view of the city from the steps in front of the Sacre-Coeur, but there were several places I wanted to see that were not in the tourist brochures. 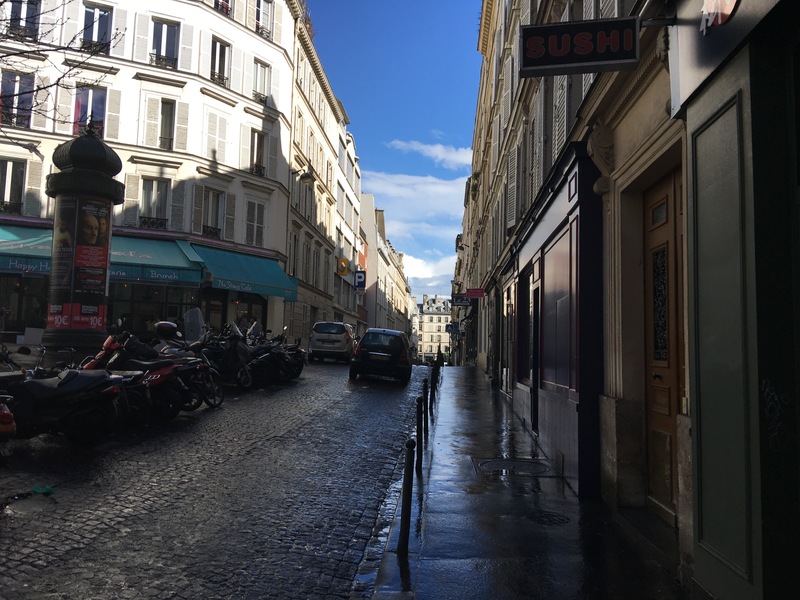 They were off the beaten path down the side streets and they meant more to me than all the rest. I got off the Metro at St. George a few blocks south of the Moulin Rouge and the first sign I saw was Rue de Notre Dame de Lorette and I knew I was close. 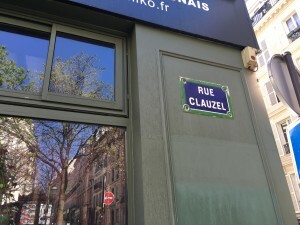 I headed up that famous street and took a right on Rue Henry Monmier and in only a block I saw that little blue sign on the building on the corner that said Rue Clauzel. As I turned down that narrow street I got a little chill. I imagined myself among others walking down that little street. On my left was Camille Pissarro and Paul Gauguin. 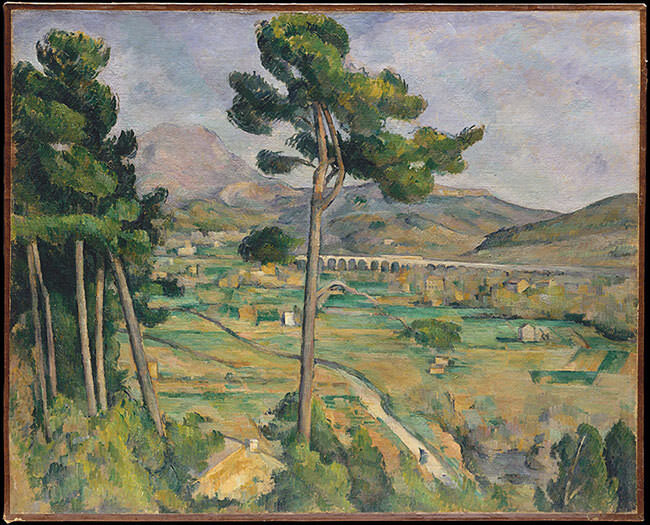 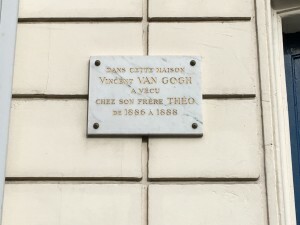 They both had apartments nearby and on my right were Vincent Van Gogh and Paul Cézanne. 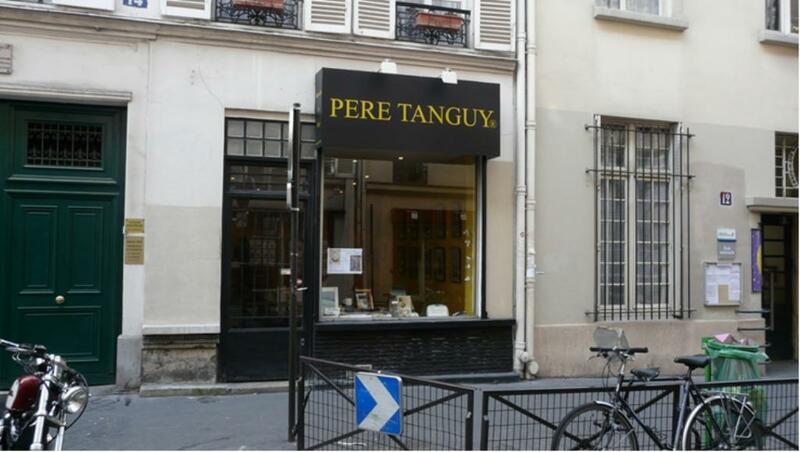 They and many others came down this street and walked on these same stones to visit their friend and their favorite dealer of painting supplies, Julien “Pere” Tanguy. 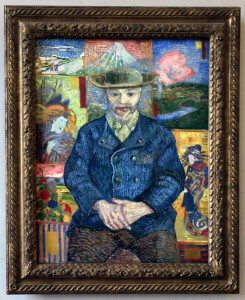 He was not only a seller of art supplies, but he was also an art lover. 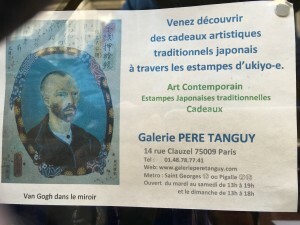 He also sold Japanese wood block prints and, to his wife’s chagrin, he often traded supplies to artists in exchange for their work that he showed in a little gallery in the back of the shop. 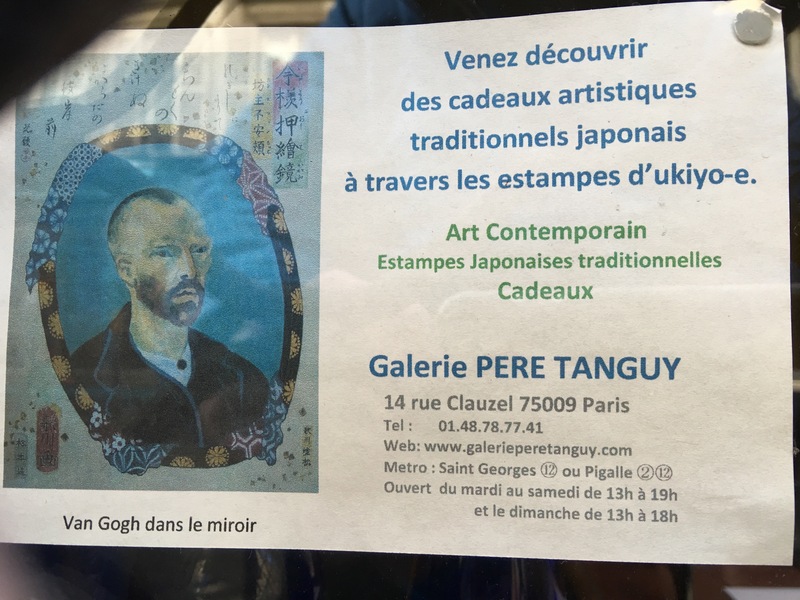 Today a Japanese gentleman runs a shop on the site and fittingly, he sells woodblock prints. 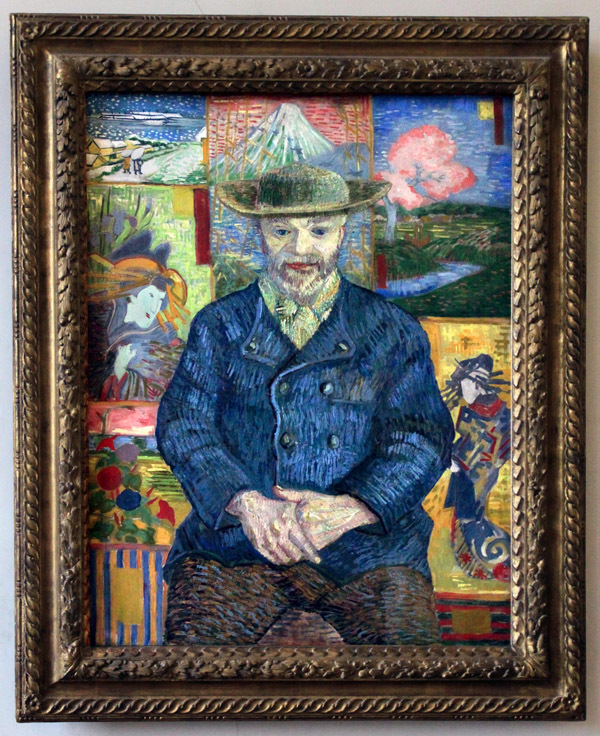 Van Gogh painted his portrait three times and my favorite was purchased from Pere Tanguy’s estate by Rodin and it now hangs in the Rodin museum here in Paris. 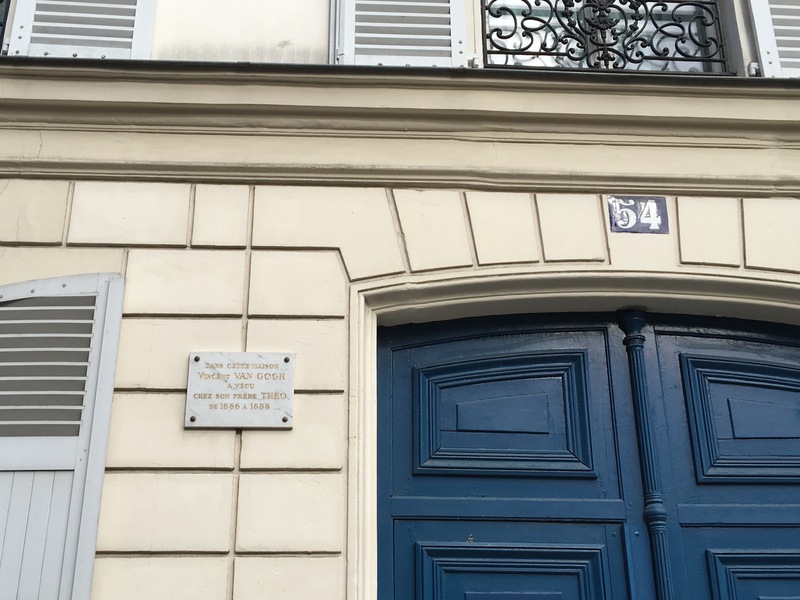 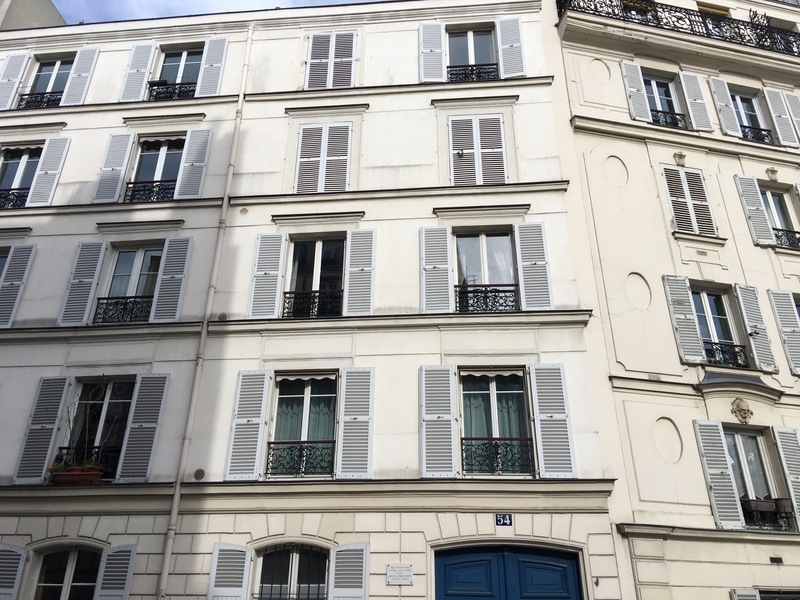 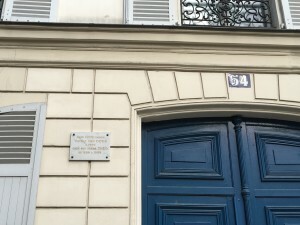 After my memorable walk down Rue Clauzel and I headed up to the heart of Montmartre and walked by Gauguin’s old apartment and then I stopped by to see where Theo and Vincent Van Gogh lived at 54 Rue Lepic from February of 1886 until he moved to Arles in February of 1888. Then I was on to my last stop of the day at the site of famous Le Bateau-Lavoir. 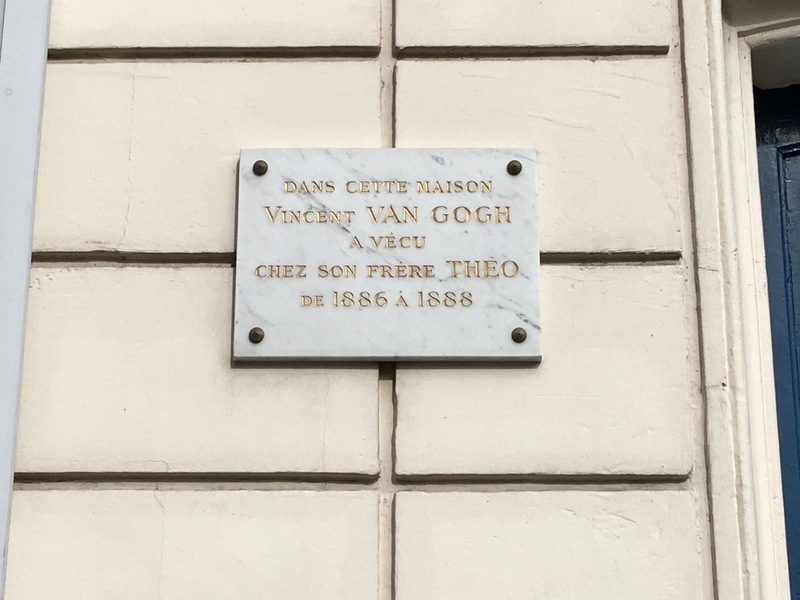 To list all of the famous artists who lived here would take awhile, but if you examined a Sotheby’s or Christie’s modern art auction catalog from today you would see many of their names. 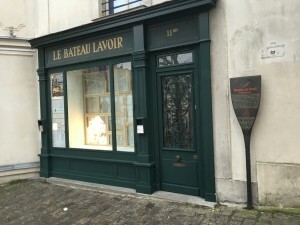 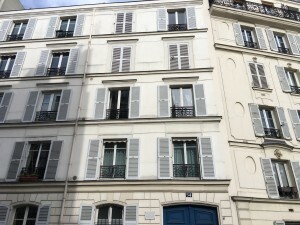 The original building burned in 1970 and was rebuilt, but the stone façade and the memories remain from this place at 13 Rue Ravignan just down the hill from Place du Tertre. 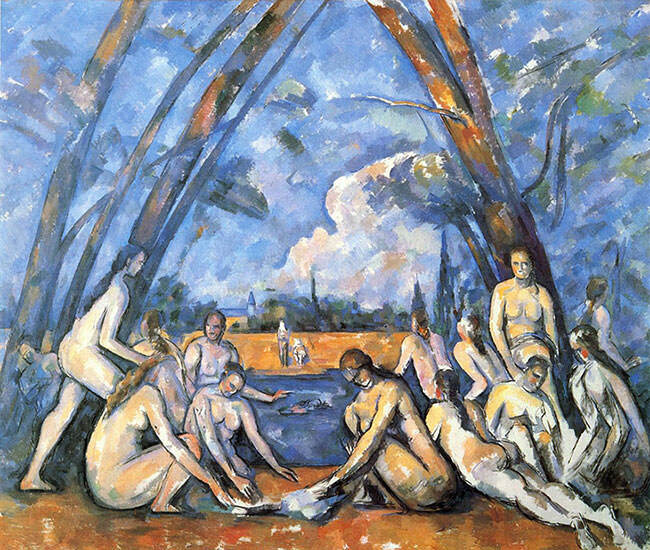 It is where the dealer Henry Kahnweiler first saw Picasso’s “Les Demoiselles d’Avignon”. 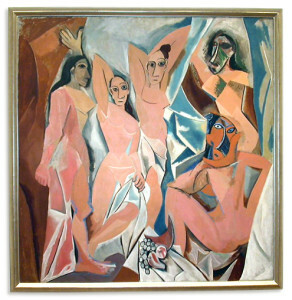 Picasso painted it there in 1907 and it was the picture that launched cubism inside Le Bateau-Lavoir although it was not revealed to the public until 1916. 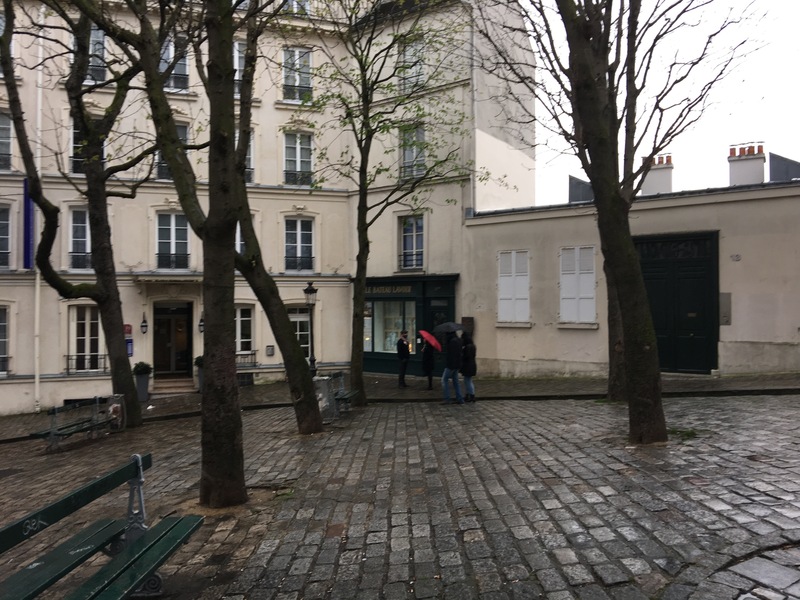 I will always remember the old photograph I saw of the doorway and the sign next to it that Picasso hung there that said “Les Rendezvous des poets”. 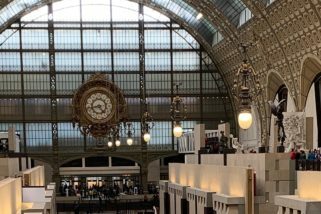 Oh to be sitting in there one night with a few bottles of wine just listening to Picasso and his close friends poet Guillaume Apollinaire, Jean Cocteau, George Braque, Max Jacob, Modigliani and others as they discussed art and poetry and politics. Il serait incroyable! It would be incredible! 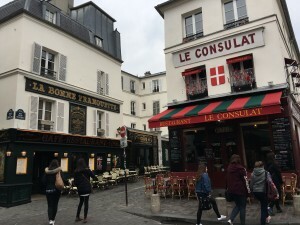 My rainy day in Denver has just been transformed! 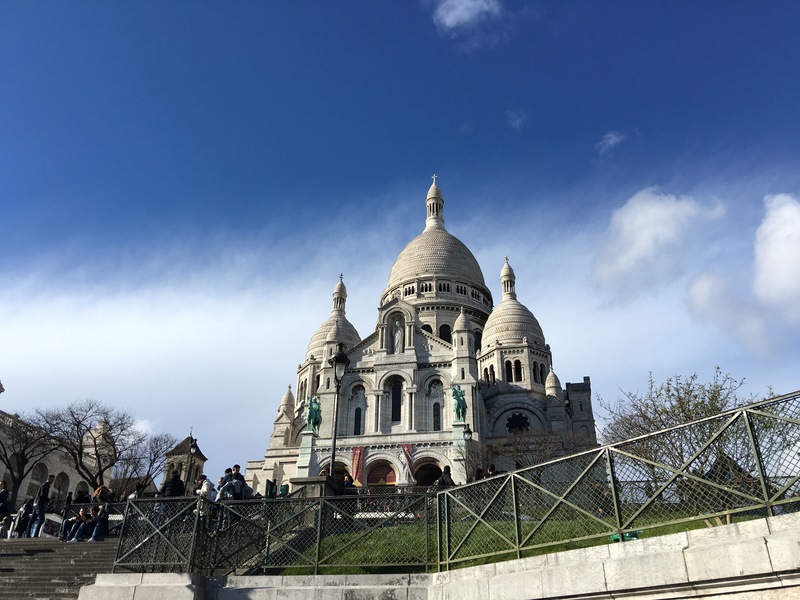 Thank you for a most interesting tour.